Quote Reply Topic: Projection 762 Help please? I"m in France and I have à Projection 762, probably built in 1995 and imported in France in 2007. My boat is near Vannes (south of britanny). This boat didn't sails since about 3 years. There's a little bit of work before putting it back on the water. I have a trailer (R.M. trailer) but without French papers therefore only for storage. I still hesitate to refurbish it and I will appreciate having your opinion on some points like chainplates, rudder bearing wear and a strange double pole below the mast. I don't know if this part is critical. I will see how to post pictures on this discussion. I have a new unused symmetric (yes symmetric) spinnaker from a J80 for sale. Haven't measured it but it cannot be far away from working on a Projection. Mail to nigel@rigmagic.co.uk if interested. Kite flies pretty high on boat , reckoned could fly something bigger without changing the hoist . We're on the look out for a replacement kite as ours is knackered/blown! We've got Burnham week coming up so so time to get a new one made. Does anyone have one a spare kicking around that they might want to sell? Hi thomas we went a sail this year and haven't looked back. We have a 55m2 runner and a 45m2 reacher. We are carrying the big kite in some big breeze and the boat is lighting up. Jamesrose do you still need to know track size? Passed comfortably numb on the motorway today. On the way from the ferry. Is she staying In the country? Does anyon happen to know the size of the Genoa track on the 762. Is it 26 or 32mm or neither of those ! 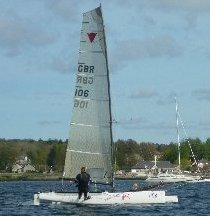 For this season we would like to order new spinnaker for our P762. We have one quite good runner, about 46.5m2 (maybe somebody remembe white with red F, "the F word"), and we would like to have some S3 reacher, maybe somebody have some recommendations, measurements or tips for this kind of spinnakers for Projection 762.